At Feigenbaum Dental, we strive to provide our patients with the highest level of care for a truly great dental treatment. In addition to our exceptional qualifications and reputation as a dentist in Creve Coeur, our dental team embraces the latest dental technologies. By utilizing the most advanced technologies, we can provide a higher level of care for superior results. State-of-the-art technology gives us the opportunity to enhance your comfort while providing more precise diagnosis and treatment. Among one of the latest advancements in our dental office includes an intraoral scanner. Our office is pleased to announce the addition of the TRIOS 3Shape intraoral scanner. This finger-sized scanner eliminates the need for impressions for many common dental procedures. Often, impressions cannot be used on those who have strong gag reflexes, jaw problems, or severely damaged teeth. Not to mention, no one likes to sit there with the uncomfortable material in their mouth. Now, you do not have to with the intraoral scanner. The digital impressions provide us with more detailed information instantly. There is no more mess or discomfort as the scanner provides highly-detailed images for enhanced accuracy. It can be used for restorations and an array of other treatments. The color images are HD photos to improve the details of the impressions. This allows measurements to be more accurate and readily available. This decreases the amount of time you will spend in our office while promoting your overall comfort. By using this revolutionary piece of technology, you benefit from increased precision to remove any room for error when creating dental crowns, inlays, or onlays. Not to mention, the images are easily storable for documentation within your dental file or to share with specialists and your insurance company for diagnosis and treatment. In addition to the intraoral scanner, we provide several other advancements in dentistry to give you the ultimate dental experience. You will also enjoy digital x-rays. When compared to traditional x-rays, the digital images provide a higher level of details instantly. Plus, there is less exposure to radiation and a comfortable process because you no longer need to bite on films. We also offer laser dentistry to reduce the need for scalpels and stitches. The laser can be used to aid a wide range of treatments, such as periodontal therapy and gum contouring. The laser improves the recovery time while minimizing risks as it sterilizes the area and reduces damage to surrounding tissues. Are you asking yourself, “where is a dentist near me for the ultimate dental experience?” Look no further. Feigenbaum Dental embraces the latest dental technologies and methods to provide our patients with a dental experience like none other. You will enjoy a higher level of care while promoting your comfort and satisfaction. 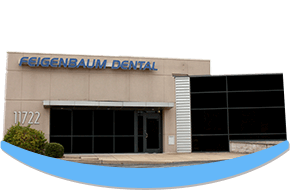 When choosing our modern dental practice for all your dentistry needs, you will benefit from the best with Feigenbaum Dental. Contact our office today to schedule a consultation.